With the recent approved review of the package crtools in Fedora I have made a feature proposal for checkpoint/restore. To test checkpoint/restore on Fedora you need to run the current development version of Fedora and install crtools using yum (yum install crtools). Until it is decided if it actually will be a Fedora 19 feature and the necessary changes in the Fedora kernel packages have been implemented it is necessary to install a kernel which is not in the repository. I have built a kernel in Fedora's buildsystem which enables the following config options: CHECKPOINT_RESTORE, NAMESPACES, EXPERT. After installing this kernel I am able to migrate a process from one Fedora system to another. 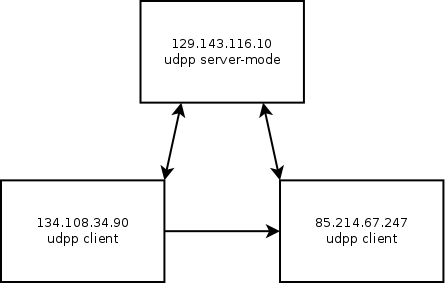 For my test case I am migrating a UDP ping pong (udpp.c) program from one system to another while communicating with a third system. So with only little changes to the kernel configuration it is possible to migrate a process by checkpointing and restoring a process with the help of crtools.